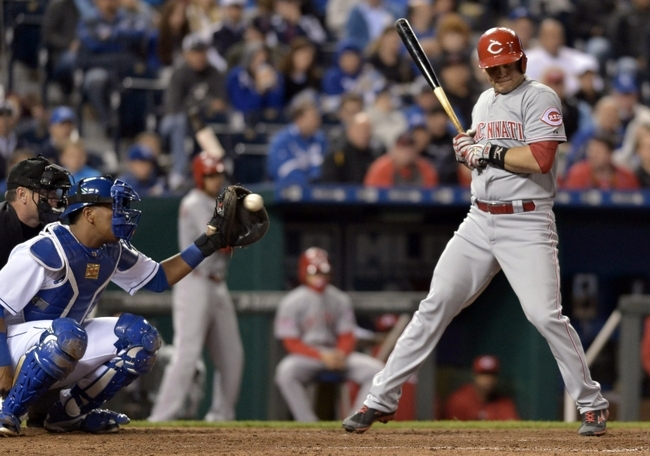 This week began interleague play for the Kansas City Royals, as they would welcome the Cincinnati Reds into town for a short 2 game series at ‘The K’. I’m not the biggest fan of interleague games(I like having the two leagues only meet up at the All-Star Game and the World Series) but at the same time it is always interesting to see teams come into town that we probably only see maybe once every three years. So would the Royals welcome their competitors from the National League nicely…or would Kansas City show them why they are in first place in the American League Central? I think it would be safe to say the Reds received the latter. Moustakas already has more than half as many hits as he had all of last season, despite playing just 37 games (compared to 140 last year). 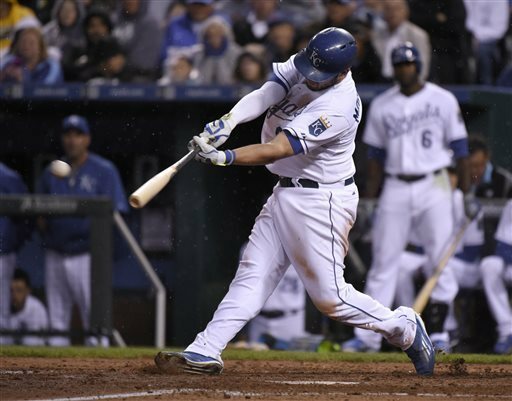 Mike Moustakas has seven three-hit games this season. That's a career high, and it's one more than he had in 2013 and 2014 combined. It’s hard at this point not to get excited about what Moustakas is doing at the plate and in the field(where he is in 7th place in defensive WAR with .86). Through 37 games he is over half way to his hits and runs total, has a slash line of .342/.396/.503 and an OPS+ of 147. In fact the only numbers that seem down from last year is that he has been caught stealing twice this year after not getting caught at all in 2014…and since he is not a base stealer those numbers mean absolutely nothing. The 2015 version of Mike Moustakas(Moose 2.0?) is an all around complete hitter that has solidified the number 2 spot in the order and continually has been getting on base. It’s amazing how something as simple as learning to hit the ball to the opposite field would open up his game and make him an offensive force. Now we are only nearing the end of May, so there is still a number of months left in the season, but he has already surpassed my expectations of Moustakas being a ‘.250 hitter at best’. Another few weeks of this play and he will most definitely have punched his ticket to head to Cincinnati in July for the All Star Game. 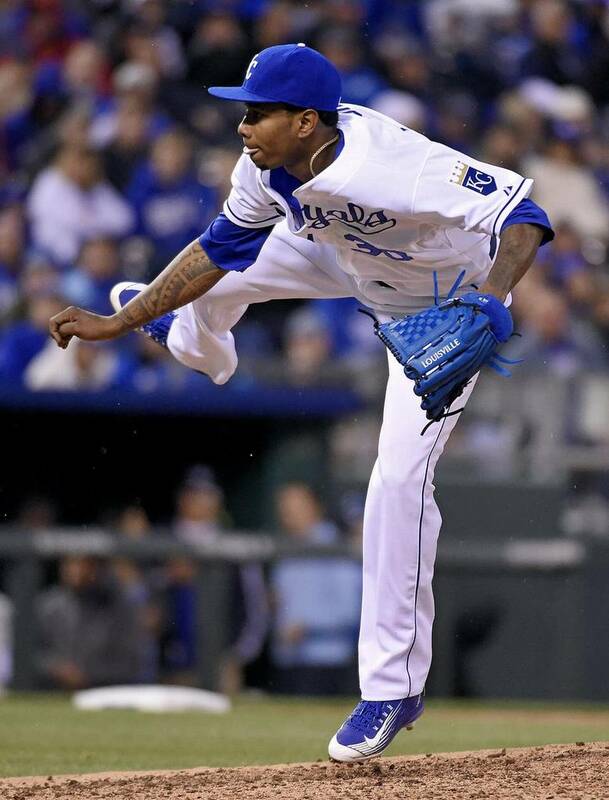 Yordano Ventura came into this year with a ton of hype and the mantle of being the Royals ace of the rotation. Unfortunately he has gone through some growing pains this year(trademark: Thicke, Alan) and outside of a few starts where he left early due to cramps he has mainly underperformed. Luckily, the Ventura we saw quite a bit of last year showed up on Tuesday night and threw a gem of a game. Ventura went 7 innings, allowing 4 hits and no runs while walking none and striking out 6. He threw 61% of strikes and for the most part let his infield do most of the dirty work, as he induced 14 ground balls. The best part was seeing no walks and Ventura didn’t nibble around the strike zone as much as he has his last few starts. This seemed like the guy we saw in Game 6 of the World Series and someone who could lead this pitching staff. I’m sure we will see a few more bad starts from Yordano before the year is up, but if he can limit the damage and pitch more like he has this week, it will help solidify the rotation and leave one less worry for the team on the mound. 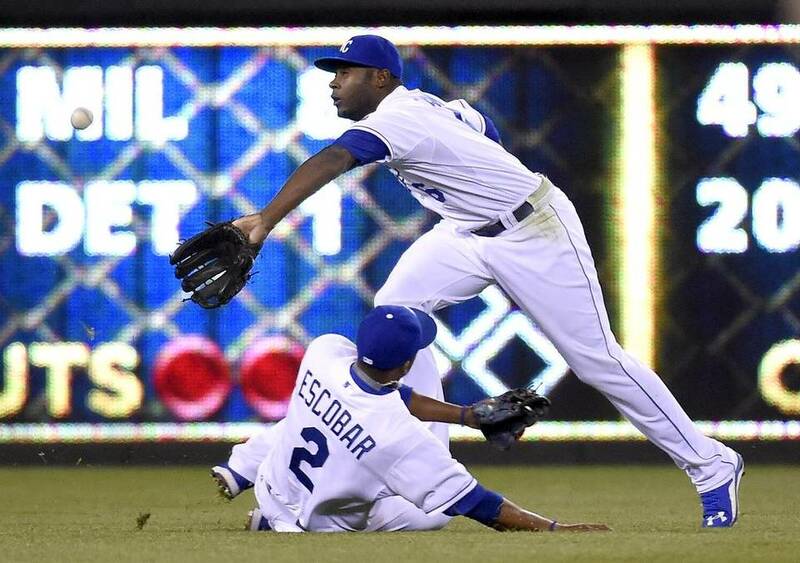 Guthrie on Gordon: "That catch is not made by 29 other left fielders." Alex Gordon's four-year-old son, Max, likes to imitate his dad. He yells "Here goes Alex Gordon!" and runs face-first into walls. The only bad thing to the greatness of ‘A1’ is that if he doesn’t pick up the option on his contract after the season then he could venture off to some other team this offseason. I don’t know about you, but I don’t want to live in a world where Alex Gordon isn’t a Kansas City Royal. Just the thought along makes me queasy. I am not ready to have him take his skills elsewhere. Tack up 3 solid starts in a row for Jeremy Guthrie, all much needed. On Wednesday, Guthrie threw 6 innings giving up 5 hits, and no runs while walking 2 and striking out 3. Guthrie ran into some trouble early on in the 1st inning but after that seemed to calm down and held Cincy scoreless. These last 3 starts has lowered his ERA by almost 2 runs as he has allowed 4 earned runs in 18.1 innings. After his awful start to the season he has righted the ship and seems to be pitching more to his career performanace. With others in the rotation struggling, the Royals need Guthrie to at least be a solid turn once every 5 days. 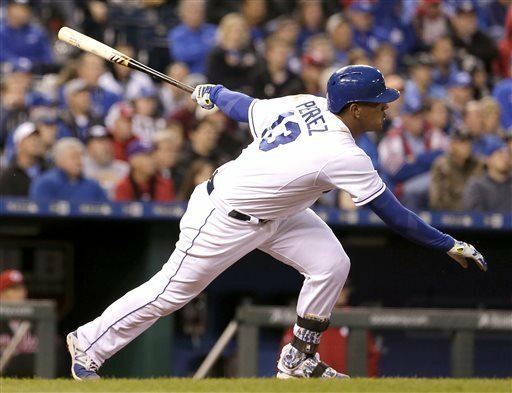 There has been some discussion about Alcides Escobar maybe not being the right fit at the top of the lineup. Actually, Craig Brown of http://www.royalsauthority.com had a column last week talking about how Escobar doesn’t take enough pitches and hardly walks, which neither is a good approach at the dish if you are the leadoff hitter. I agree with Brown for the majority of this argument and his reasoning is solid. The issue is that the Royals really don’t have a typical leadoff hitter, other than possibly Alex Gordon, and you can see the argument for keeping him in the middle of the lineup. With that said, the Royals are winning with this lineup despite Escobar’s .331 OBP, which is almost purely from hits as he has only 5 walks on the season. I get where Craig is coming from on this, but I can’t imagine a change will happen anytime soon. Unfortunately, they weren’t able to make it 3 shutouts in a row, as Ryan Madson gave up a run on Wednesday night. Still an impressive feat, nonetheless. It is always nice to have a healthy Holland. The thing is, without him available, they still have guys like Madson, Luke Hochevar and Jason Frasor who can do some of the heavy lifting, and Wade Davis is as good as any closer in the big leagues today(and goes to show you how out of date it is the way managers use their best pitchers in the bullpen nowadays). To have these other options has to be frightening to other teams and will be even more important later in the season. Kendrys Morales is second in the AL with 28 runs scored. He scored 28 runs all of last season (50 more games played). Alex Rios still hasn't taken batting practice yet. A lot has to go right for him to start a rehab stint in 7-10 days. 29,769 fans showed up for a Tuesday night game in the rain against the Reds. It's May 19th. The Royals' run differential of +58 is better than their run differential in ANY season since 1982. At this exact moment, the Royals' run differential (+58) is better than the next THREE AL teams (Houston, TB, NY) COMBINED (+57). The #Royals have tied a club mark from 1976 with 24.0 consecutive scoreless innings. #Royals win! Their 26-14 record is the best 40-game start in team history! The Kansas City Royals since July 30 of last summer (including the postseason): 73-39, with a run differential of +106. So with the Reds out of the way, this leads to a major matchup for the Memorial Day Weekend. It’s the best record in the American League against the best record in the National League, as the Cardinals come to Kauffman Stadium to take on the Royals. For years Cardinals fans come in swarms to Kansas City and the crowd ends up looking like a sea of read. Well, I have a feeling that won’t happen this time, as it should be a sea of blue this weekend. It also means this dormant rivalry, that really hasn’t meant anything for years now actually has some more punch behind it. I would love a series win for the Royals, sending the Cardinals back to St. Louis with their tail in between their legs. If anything it would quiet the ‘best fans in baseball'(and most of us are really tired of hearing Cardinals’ fans flapping their gums) without even having to bring up 1985. The more I think about it, a sweep at ‘the K’ would be beautiful. Hey, it’s lofty expectations but just imagine that warm and fuzzy feeling we would get from that, Royals fans? Yep, it would feel good. Very good.